Multi-site climate change experiment (flooding, warming and drought) from semi-arid regions to mountain-top locations across the Iberian Peninsula. Project lead: Miguel Matias and Miguel Araújo. Jan-Dec 2019. The Iberian Pond Network (IPN) is open to users to collaborate on the main experiment or complementary ones. The experiment is yearlong so in principle, we would be able to receive users all year round contingent on the availability of human resources to accompany the research to the different locations. Preferred for visits: April to July. We will remain “open” for business all year round but restrict stand-alone projects that require traveling to each of the 6 locations away from our sampling windows. Food-web and Network flow analysis, particularly researchers with access/funding isotopic and molecular analysis. Taxonomic and trait determination of key groups: macroinvertebrates, zooplankton and phytoplankton. In-situ spectrophotometric tools to determine phyto- or periphyton abundance/growth (e.g. BenthoTorch). Carbon cycle and greenhouse gas emissions (i.e. CH4, CO2 emissions). Litter decomposition measurements during wet and dry phase of ponds. TA-Users: Typical sampling team to go around all 6 locations would be 2 users + 2 host research team members. Users must be accompanied at all times particularly in remote locations. In principle, the optimum number of users at the same time would be 2 with a minimum stay of 2 months. We foresee a total of 4 users during the Spring sampling period (April to end of July). Access during non-sampling periods is contingent on the availability of local researchers. Description of the experiment: The main experiment is about “Testing the effects of climate change on aquatic food-webs from semi-arid regions to mountain-tops”. Ongoing treatments include flooding, warming and drying out ponds in 6 different locations across the Iberian Peninsula. All 192 ponds are monitored every spring using standard procedures, including plankton nets, water chemistry and molecular techniques. The Iberian Pond Network (IPN) is open for AQUACOSM TA approved users to collaborate on the main experiment in 2018 or complementary ones. The experiment is yearlong so we would be able to receive users all year round after arrangements. The main sampling season runs from April to July 2018. A typical sampling team to go around all 6 locations would be 2 users + 1 host research team. Maximum at any given time would be 4 visiting users. Users must be accompanied by host team members at all times particularly in remote locations. At least 128 person-days will be allocated to external users in 2018, which will be integrated into the existing schedule of the IPN. 4 persons for 32 days is recommended to successfully conduct an experiment in the pond network. Access to the facility will consist of visits to each of the 6 Iberian sites, for sampling and field measurements. Each visit involves a circuit of ca. 4000 km across the Iberian Peninsula. The circuit must be done by car because public transport to the typically remote locations where the mesocosms are installed is unavailable. We are looking for people interested in modelling network flows using existing data. We would also be interested in hosting people working with stable isotopes, environmental DNA and greenhouse gas emissions (i.e. CH4, CO2). Experiment: The main experiment is about “Testing the effects of warming and drought on aquatic food-webs from deserts to mountain-tops”. 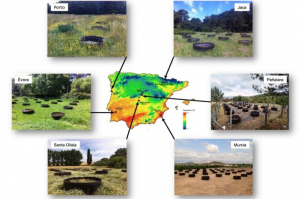 It involves warming and drying out ponds in 6 different locations across the Iberian Peninsula. All 192 ponds are monitored every spring using standard procedures, including plankton nets, water chemistry. 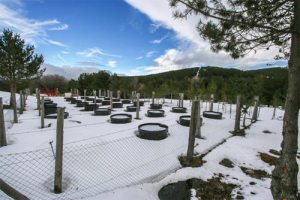 The Iberian Pond Network (IPN) is a novel mesocosm system built in 2014 to investigate ecological responses to climate change across bioclimatic regions. This innovative infrastructure includes a range of environments from semi-arid conditions to mountain tops. 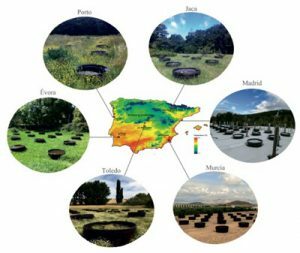 A total of 192 mesocosms, each 0.70 m deep and 1.85 m in diameter, are deployed across 6 regions on the Iberian Peninsula (Fig. 6.16.1). Locations include semi-arid (x2), Mediterranean (x1), temperate (x1) and alpine (x2) environments. This distribution of sites along a climatic gradient over a large area is expected to provide insights into effects of climate change, biogeography, biotic interactions, biodiversity and ecosystem processes in pond food webs. At each location, 32 mesocosms with a volume of 1000 l each were placed at ca. 3-5 m distance from one another. The mesocosms are equipped with an automated system controlling temperature and water level, thus enabling simulations of future climatic conditions. The mesocosms were recently set up and initiated by adding 100 kg of locally collected topsoil, then filled with local water. Repeated additions of macroinvertebrates, macrophytes, sediment and water containing plankton were intended to minimize differences among sites associated with variation in the starting date and to mimic natural colonization of the ponds. All mesocosms have been left untouched to date to allow establishment of aquatic food webs until experiments start. Fig. 6.16.1 Distribution of mesocosms of the Iberian Pond Network in the Iberian Peninsula (left) and view of a selected site, Peñalara Natural Park at the Guadarrama Mountains near Madrid in winter (right). A total of at least 384 person-days will be allocated to external users, which will be integrated into the existing schedule of the IPN. A minimum of 4 persons for 32 days is recommended to successfully conduct an experiment in the pond network. Access to the facility will consist of visits to each of the 6 Iberian sites, for sampling and field measurements. Each visit involves a circuit of ca. 4000 km across the Iberian Peninsula. The circuit must be done by car because public transport to the typically remote locations where the mesocosms are installed is unavailable. Services currently offered by the infrastructure: The infrastructure provides 32 replicate ponds at each of 6 locations to emulate small freshwater ecosystems in a variety of bioclimatic regions representative of selected climate types in Europe. Such a biogeographically distributed and fully replicated mesocosm infrastructure provides unique opportunities for experimentally testing predictions of the impacts of environmental change on the structure and function of aquatic ecosystems. Testing of climate-change effects can take the form of warming experiments, space-for-time substitutions across the network, or a combination of both. 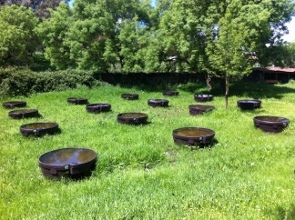 The integration of the Iberian Pond Network with identical mesocosms, like at Imperial College London (see below) or similar systems in Europe, particularly in the AQUACOSM network, will provide unprecedented opportunities to examine the context-dependency of effects of environmental change on a variety of aspects of aquatic ecosystem dynamics. In addition the IPN can be used for studies addressing fundamental questions relating to spatial patterns of community composition and function at biogeographical scales. 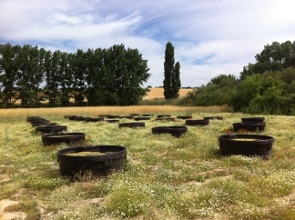 The mesocosms were originally established with funds from the European Structural Funds and are currently used in 4 research projects, 2 funded by the Portuguese Foundation for Science and Technology, the 2 others through the Spanish Ministry of Economy and Innovation and the UK National Environmental Research Council. Visitors are given access to previously inoculated, well-maintained and controlled systems that are currently monitored on a regular basis. Based on established data-use agreements, external users are given access to baseline data on water chemistry and species composition in the mesocosms and in turn complement information in the data base with their own data. Support offered under AQUACOSM: All users supported through an AQUACOSM TA will have access to the mesocosms and associated facilities, equipment and data described above. Technical staff is available to support sampling and take users to the different sites where the mesocosms are installed. A fully equipped freshwater ecology lab is available at the University of Évora to analyse water, microbial, plant and macroinvertebrate samples.